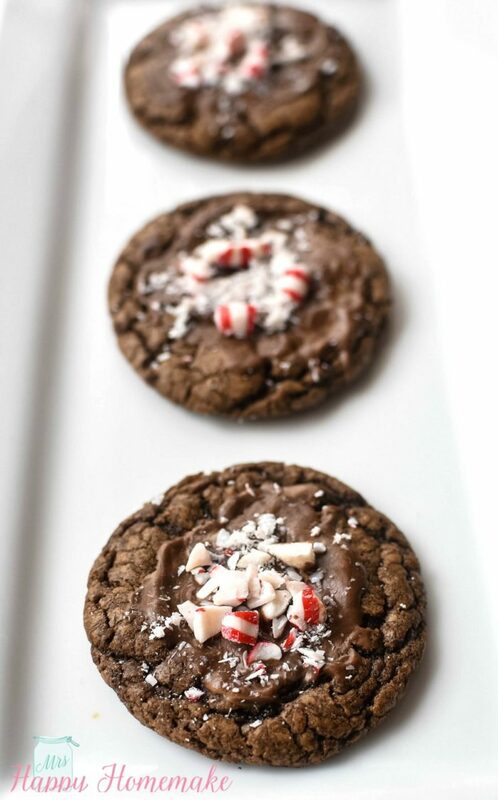 These Chocolate Peppermint Cookies are so delicious – fudgy cookies, melty Andes mints, & crushed peppermint candies. The perfect addition to your Christmas cookie lineup! 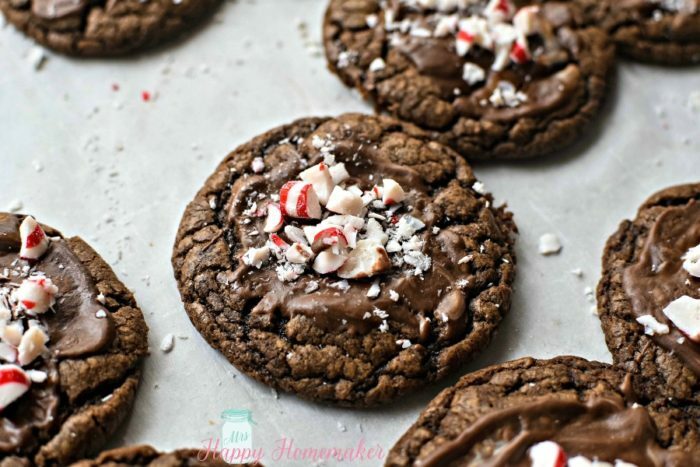 These Chocolate Peppermint Cookies are one of my favorite cookies to make during the holidays. I make them every single year. 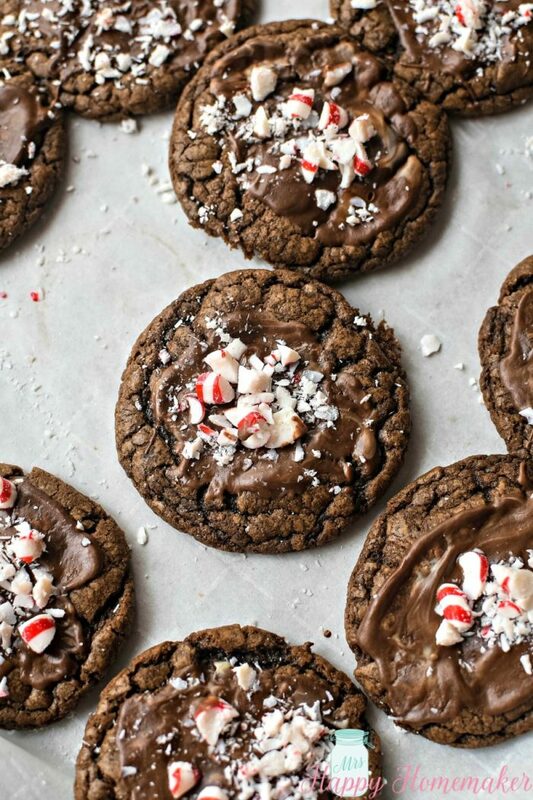 Indulgent chocolate cookies topped with a melty chocolate mint layer & peppermint candy crumbles. Oh my, they are so delicious! 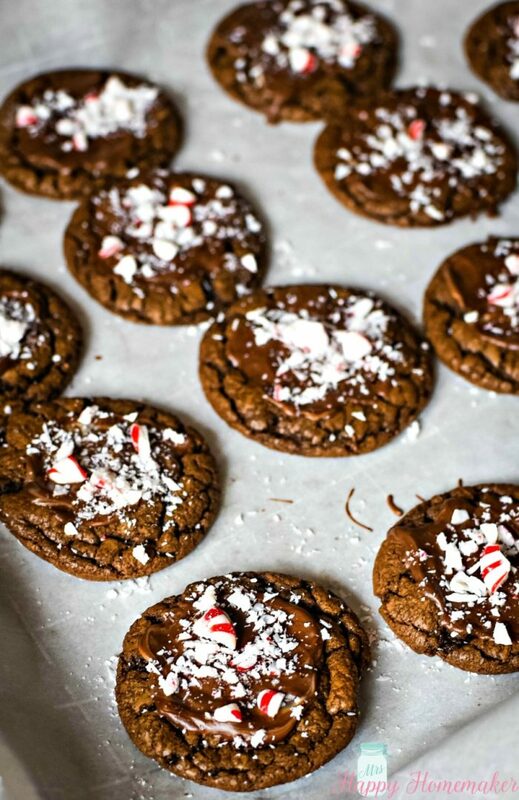 The secret to the super-duper ‘melt in your mouth’ chocolate-y cookies is actually melting the chocolate chips with some butter, sugar, & a tad of water – and then adding your dry ingredients & eggs. It’s honestly like making a shortcut fudge, and then making cookies out of it. The ‘splatter’ of melted Andes candy on top of them & the crumbled candies looks so pretty! If you don’t like mint, these cookies are good without the mint topping. 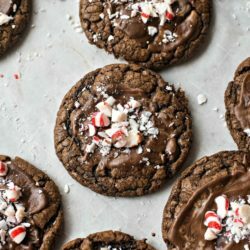 Just really amazing chocolate cookies. In a large pan over low heat – cook butter, sugar and water until butter is melted. Add the chocolate chips, remove from the heat, & stir until melted. Pour into a large bowl and let stand 10 minutes to cool off slightly. At high speed with an electric mixer, beat in the eggs one at a time. Add in the vanilla extract. Reduce speed to low & add the dry ingredients, beating until blended. Chill dough for about 1 hour. Roll dough into balls and place on ungreased cookie sheet about 2 inches apart. Bake 8-10 minutes. While cookies are baking, unwrap mints and slice each in half. When cookies are brought out of the oven, put 1/2 mint on top of each cookie. Let the mint sit for up to 5 minutes until melted, then spread the mint on top of the cookie. Sprinkle with crushed peppermint candies.